Nusa Dua Beach - Bali Island has many world-class beach resorts. such as Kuta Beach, Sanur Beach, Tajik Benoa Beach, Padang Padang Beach, Dreamland Beach. Well if you want to enjoy the beauty of the beach in Bali with a natural atmosphere, calm and peaceful, Nusa Dua Beach is the ideal place for your vacation to the island of Bali. One of Bali's Most Beautiful Beaches is the Geger Beach located in the Nusa Dua area of Bali or about 20 kilometers from the city of Denpasar. Geger Beach or Nusa Dua Beach presents beautiful and mesmerizing coastal scenery with its soft white sand beaches, calm and crystal clear sea water so much you can do on this beautiful beach. The location is a little hidden and away from the crowds with a calm beach atmosphere plus the peace that is served to make you fall asleep on this Geger Beach. At Nusa Dua beach Bali, you can do various water rides, camel rides with Camel Bali Safari, Fishing or canoeing, sunbathing, swimming and relaxing enjoying the sunset atmosphere at dusk with various beach restaurants providing umbrellas beach you can use for shelter. 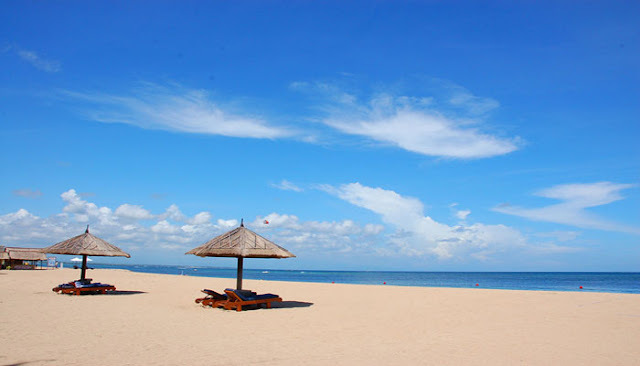 Some of Nusa Dua Beach or Pantai Geger is also a Beach Privacy area of ​​The Mulia Hotel Nusa Dua and Hotel Nikko Bali, so the Beach Geger is very clean. The white sand is so tempting, the water is crystal clear sea that makes you feel at home linger on this beautiful beach. In addition to enjoying the beauty of Nusa Dua Bali Beach with all the amenities, On the south side of the beach looks a small hill where you can see the existence of Pura Geger Dalem Pamutih. 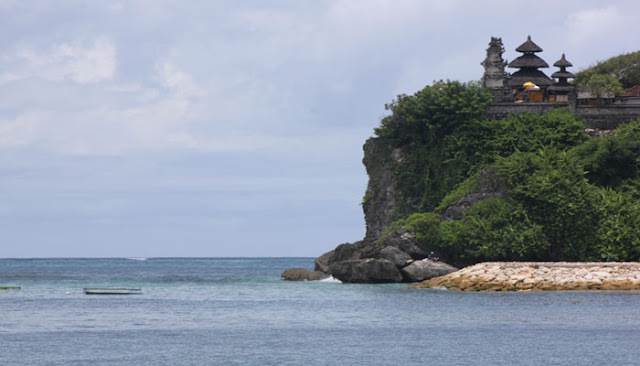 In addition, you can visit Pura Geger Dalem Pamutih, from the top of the hill you can also see the natural scenery of the beach with the waves that hit the rock. In addition to enjoying the beauty of Nusa Dua Beach On the island of Bali, Not far from the beach Geger You can also visit other interesting places on the island of Bali, there are many places to visit in Bali which is adjacent to Nusa Dua Beach Bali such as Tanjung Benoa Beach, Riding Camel At Sawangan Beach, Pasifika Museum, Pandawa Beach, Dreamland Beach, Garuda Wisnu Kencana, Watching Sunset At Jimbaran Beach and other Bali beaches. Make your holiday more complete by visiting a number of white sand beaches Bali beach in the southern part of Bali especially enjoy the beauty of Nusa Dua Beach on the island of Bali.